Each Web Browser comes with a default search engine that users can use to perform search pe Internet, Most of them using the default search engine Google Search. Of the four browsers frequently used by users (Firefox, Chrome, Opera si Internet Explorer), Internet Explorer is the exception, it came bundled with BingOwn search engine microsoft. 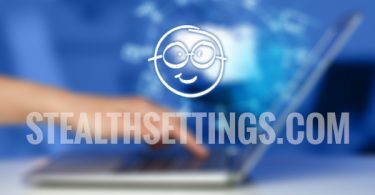 But considering the fact that each browser can be set only one default search engine, which supports aliasesThat allow users to perform searches on other search engines besides the default. 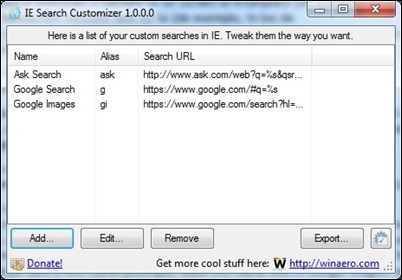 IE Search Customizer is a free utility that allows users to define search custom (aliases) In browser Internet Explorer. Specifically, the utility gives users the possibility to create aliases that can be used to perform custom searcheson custom search enginesDirectly from address bar IE browser (without them having to modify the default search engine of the browser). 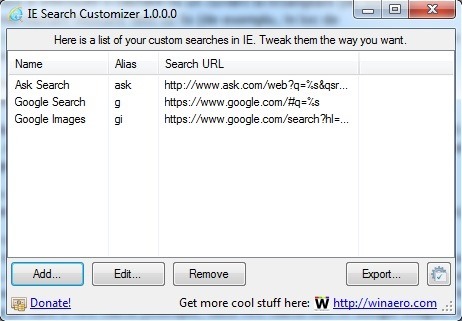 How does IE Search Customizer? 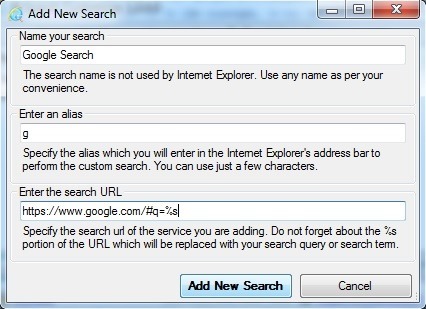 To create aliases for searches on custom search engines directly from IE address bar, open IE Search Customizer and click on the button add. In the open window enter the name for custom search (Eg if you want to create a alias for Google Search, Named custom search Google or Google Search; If you want to create an alias for Google Images, Using the name Google Images) In the field below Name Your Search. Then defined alias for the custom search field below Enter an alias (For example, Google use alias g, For Google Images, Use the alias gi, For Ask use alias ask etc.). In the field below Enter the search URL enter the resulting URL from the search performed search engine for which you want to create alias. For example, if you want the alias to perform a search in Google Images, Perform a search using any word in Google Images, then the resulting URL replace that word with %s; when you perform a search with an alias, % S will be replaced the word / phrase that you seek (eg if you search test in Google Images, Url search will be https://www.google.com/search?hl=en&site=imghp&tbm=isch&source=hp&biw=1366&bih=683&q=test&oq=test&gs_l=img.3..0l10.1465.1803.0.2157.4.4.0.0.0.0.121.331.2j2.4.0….0…1ac.1.48.img..0.4.325._lS81CzRIVo; in the URL, replace the word test with% s, and will result in the url that you will use to create alias for Google Imagesie https://www.google.com/search?hl=en&site=imghp&tbm=isch&source=hp&biw=1366&bih=683&q=%s&oq=%s&gs_l=img.3..0l10.1465.1803.0.2157.4.4.0.0.0.0.121.331.2j2.4.0….0…1ac.1.48.img..0.4.325._lS81CzRIVo). After you add aliases for custom searches in Internet Explorer, Whenever you want to make a search with one of the aliases added, first enter the desired alias, then the term you want to search. Specifically, if you search a term custom search engine, type in address bar First alias that you have chosen for the search engine then search term and press Enter. This will display all the results of this period found using custom search engine (for example, if you want to perform a search on Ask.com, Type in the address bar ask wordWhere replace word the required dates). Note: Custom Searches added to IE Search Customizer are compatible with all modern versions of the browser Internet Explorer.